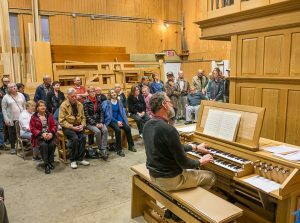 On April 1, a beautiful Spring Saturday afternoon, members of the Tacoma chapter, Seattle chapter, and guests gathered in the suburbs of Roy, WA to see and hear Pasi Opus 26, a 2-manual 19-stop organ to be delivered later this year to Grace Episcopal Church in Holland, MI. Martin Pasi graciously welcomed the audience and introduced the organ, which is temporarily assembled in a large, high-ceilinged room in the Pasi shop. Paul Tegels, organist at Pacific Lutheran University, performed a demonstration recital, featuring works of Bach, Scheidemann, Krebs, Walond, and Kittel. Several people sat down and tried the organ while the group enjoyed a beautiful spread of wine, cheese, fruit, and the blonde brownies for which Barbara Pasi is famous!